The Voices Have Spoken. But To What End? Intro What I’ve been doing in game lately. – Not a whole hell of a lot. Special message regarding your real life health. If the provided evidence by Duckslayer is to be proven accurate, a bomb may have just been dropped on the Failheap Challenge forums. Supplying HTML sources and screenshots from the Greater Goon forums, it would appear that “A Rose Pedalar” has been engaging in RMT for some time (as much as over two years) by grinding rats and missions with the aid of 2 PCs running 11 virtual machines. The FHC forum thread can be found HERE. From the forum HTML that appears to have active links to current information, it would seem that operations were on a temporary hiatus due to someone fumbling the ball about the codeword used to discuss the ill-gotten PLEX. Ironically, the codeword is the same used by escorts – Roses. Verification from either parties or by CCP is not available at this time. However, the heated discussions of why this suddenly came out now rather than then is a subject of much discussion going on in the failheap thread. Speculation or discussions regarding the specific details can be found there. Normally, I don’t do news. As I said in my preface, the only reason I post this is so we can get to the bottom of it. We don’t need another Somerblink ragefest full of drama that hurts our community. I ask that we give the matter due diligence and not jump to conclusions. This is a CCP matter and should be investigated accordingly. Thank you all. Let’s conduct an experiment, shall we? Well, I certainly got a lot more than I bargained for when I talked about the need to clarify RMT, especially when it comes to out of game activities like Twitch streaming. In the preceding article, Don’t Blink I offered up an argument for RMT based on a solid argument given by the crew of the High Drag Podcast. It struck me as a curious and powerful argument despite the fact that I LOVE Twitch streamers like Fintarue who inspire me. I thought the point was just a little more powerful than Ashterothi realized. Setting out to answer the question of Twitch streamers giving in-game prizes to subscribers and it’s relation to the Somerblink Pt. 3 scandal, I blogged about it and hoped to get a few nibbles. Next day, I discovered traffic from Reddit so I set out to see what was being said. Firstly, I’d like to thank “SeriousSpaceships” for the linkup. This also appeared to be a first poster, so take that with a grain of salt. That said, the title of the linked post on Reddit was a bit out of context. In my fascination to get the topic out, perhaps I came across as accusatory. Let me assure everyone that this was definitely not the case. Again, I support our communities out of game (with notable exceptions because of content or drama). But out of the haze of typical Reddit crap posts, some nuggets of enlightenment and understanding of the context were starting to surface on the gold pan. I decided to take control of the Reddit thread and try to steer the helm on topic, despite it’s rocky start. The inherent stability of the revenue stream. Overall, at about a 50% margin throughout the day, people seem to be divided among the responders to the thread. The Reddit topic floated all day from +5 to -3 and stabilized by tonight at a +1 51% rating. That tells me that despite the typical Reddit flak cannons, this does seem to be a concern of a random sample of people about just how far CCP COULD feasibly go if it chose to take up this subject as an RMT issue. Again, this is totally NOT scientific in the least, but the results are fascinating to me. Now. Do I think CCP would ever get involved in Twitch revenue? Hell no. Then again, I didn’t think Obama would get a second term so there you go. I want to thank Ashterothi and the crew of the High Drag Podcast again for the inspiration of this little social experiment. Fintarue and all you other Twitch streamers: Keep doing what you’re doing. Give those prizes, make some pocket cash, and may you always have targets to publicly blow up. Thank you all for participating and we’ll see you next time! I was never good at these things anyway to be perfectly honest. I’ll admit I blew a good PLEX worth of isk of more playing the micro lotteries offered by SomerBlink. This is surprising to me because I haven’t dropped a dime on other sites like Evebet or some other out of game site. Yes, and I did so after the first Somer fiasco. Sue me. I just never saw the big deal. So this time the argument about SomerBlink boiled down to the fact that Somer was giving in-game isk benefits through their PLEX buyback program if you bought the time codes through Markee Dragon, thereby giving Somer a few real life bucks for the referral. Offer a good buyout price on the PLEX after they were converted from time codes and people will use you for all their cash for isk needs. Brilliant. 1) You bought time codes from Markee through Somer’s referral link. 2) Somer received their share of the referral revenue from Markee. 3) Somer gave you an extra few million isk for your PLEX if you used the referral. So this basically translated into RMT because Somer gave you something in game to use them as your PLEX megastore. Hmmm… so you’re not allowed to give an in-game item for real life monetary gain. Interesting. Because I’m pretty sure that Twitch streamers have been doing that for some time – getting subscriber revenue by giving away ships and PLEX on their channels in return for the real life revenue they generate through subscribers. Now I know this sounds just argumentative on the surface, but if we’re going to call RMT every time someone makes a buck by giving out stuff in game, the circumstance that I just explained must be taken into consideration. This is why CCP needs an iron-clad RMT policy to explain why one form of in game prizes for real life revenue is okay, but another isn’t. Don’t misunderstand me, I support people who stream games on Twitch. They’re entertaining and bring people into the game. I think they SHOULD be monetarily rewarded for their efforts. But if I’m going to stay objective, I have to bring all possibilities under the same scrutiny. This isn’t going to be a popular argument. Then again, my opinions are usually pretty contestable. I’m curious to know what the community thinks. I want to apologize to everyone. It’s taken me a very long time to come to grips with the reality that I couldn’t handle the present-day society in Eve. In essence, I rage quit; but not because of some in-game plans that went awry. It wasn’t due to a substantial lossmail, corp drama, real life interference, or interactions with certain players. I quit out of disappointment. I was disappointed in the current state of the community and the decisiveness the Erotica1 scandal caused and the gasoline poured on the fire by trusted voices of the community out to make a name for themselves. I did submit a final article into the team at Crossing Zebras, but I did not expect it to get ran. As a matter of fact, I hoped it wouldn’t get published. It was a tirade of broken feelings, hurt, and shock at what we had become. So I gave up. I left without saying a word. I let a few people down in the process, and I’m sorry. I’ll spare you my last submission to Xander and Jeg. It’s of no relevance as the incident is long past us. I don’t know if I’ll be returning to the game, but I am continuing to keep my ear to the floor in the community through podcasters and bloggers when news breaks. Just think of this as an “I’m still thinking about you all” letter. Hopefully, when I do return, I can save some face and get back to business as usual. Okay. Where to begin? Let’s just dive right into some back story. Surprisingly, FrFrmPukin took the high ground and stayed out of the Twitter conversation. It boiled over until he finally reached his breaking point on Episiode 141 of Podside. Now. Although DJ Wiggles certainly has a right to his opinion, I do agree with Pukin that Wiggles should have exercised some professional courtesy and kept any creative criticism off of Twitter. I would have to venture to say that if I was in Pukin’s place, it would’ve been extremely difficult not to take this personally. Eve Radio has been an entertainment force almost since day one. Podcasters, especially FrFrmPukin and Podside, actually lift up Eve Radio as one of, if not THE, ambassadors of the game community and it’s eclectic culture. While Wiggles may genuinely believe that he can distance his opinions from that of Eve Radio, unfortunately he has two things working against this theory in my opinion. 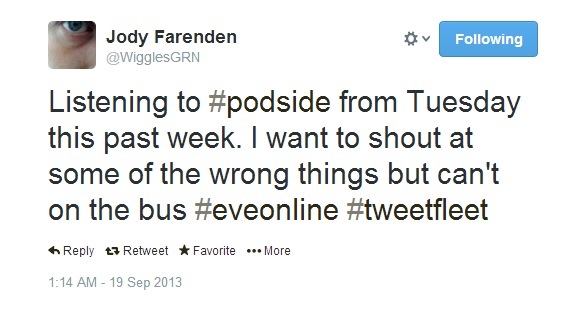 First is that his Twitter @ name contains GRN – Gaming Radio Network. Therefore, as long as he wears that title as his ID, he represents GRN. To my mind, this is the equivalent of sending out “unofficial” correspondence on a company letterhead. 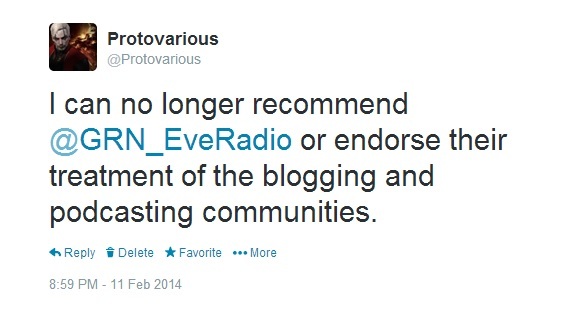 Secondly, he also administrates the Eve Radio Twitter account also under GRN. Identifying himself to the community of Eve Online as a representative of GRN on both accounts makes his voice that of GRN, no matter the case. In any event, this time Pukin directly confronted Wiggles on Twitter. Now, with that in mind let’s get into the meat and potatoes of the events that unfolded a couple of days ago. You mean give Wiggles the same courtesy that he refused to give to Pukin? No, I’m sorry. I felt that it was time to call him out on this hypocrisy. As GRN staff have made their opinions known publicly, I was free to do the same. Professional courtesy went out the window and I went both guns blazing. Did I handle this in the ideal way? In retrospect, perhaps not. However, as my sixth grade teacher taught me, I said what I meant and I meant what I said. As I also said on Twitter, I love this community. I have NO desire whatsoever to see game media compete with one another. This goes for bloggers, podcasts, radio, and forum warriors alike. I feel there is a serious lack of professional courtesy coming from GRN and its staff that threatens to start animosity between us and I won’t stand idly by as the very fabric of the relationships we have in the out of game communities go by the wayside. EVERYONE puts forth their heart and souls into what they do. You don’t have to like the content, but you’d better respect the time and effort that went into creating it in the first place. To DJ Wiggles: I have nothing but respect for GRN and it’s continuing efforts to remain a self funded source of entertainment for this entire community. I thoroughly enjoy quite a bit of programming while I’m on the road every day. FreightTrain, Dunewolf, Sarge, and FunkyBacon are my favorites. But until I see improvements in professionalism between your staff and the community, I hold to my opinion. I won’t be tuning in or urging support for GRN or Eve Radio specifically.